There is nothing classier than a custom suit. It’s one of those things that never goes out of style. After all, there is no second chance to make a first impression. Make yours last a lifetime. EZ Alterations proudly serves Fargo, North Dakota. The perfect nip here and tuck there in any piece of clothing can make it go from drab to fab! The custom suit is a status symbol for men in the boardroom. When a woman’s piece of clothing fits her body perfectly, it can make her confidence soar, making any unwanted bumps and midsection woes seemingly disappear! Ladies, we all know how painful it can be to shop for jeans. Then you finally find that perfect pair and the store doesn’t have it in your inseam! EZ Alterations is the place to come for jean hemming as well. Whatever your wardrobe dilemma is, EZ Alterations can get you looking your best in no time. When dress pants, on both men and women, are tailored and altered properly they fall perfectly, streamlining your look. 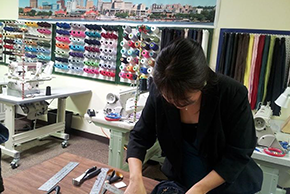 If you don’t have a full suit that needs to be tailored, we are more than happy to alter your dress pants, skirt or dress, creating a perfect silhouette. Rest assured that your custom alterations – whatever the scope – will be completed with the greatest care and dedication to quality. We work with you to create the perfect look, your satisfaction being our highest priority. It’s our impeccable craftsmanship, attention to detail and ability to deliver in a timely matter that sets us apart from our competition. Visit us today to find out more!